To generate a public understanding of the impact the community and U.S. Navy base at Dahlgren, Virginia, have had in using science and technology to strengthen national defense, particularly through support for war fighters. You’ve heard about the guns and the computers. They’re a big part of the Dahlgren story. But there’s so much more to how this Navy base has impacted the community, the nation and the world. That’s what you will soon find in the Dahlgren Heritage Museum. From the early days of this museum project, we have discovered how deep and broad the Dahlgren community really is. Those who worked on the base, grew up there or just appreciate the role Dahlgren has played are all pitching in to make this museum a reality. We need a bigger megaphone to tell the Dahlgren story. In essence, that will be the mission of the Dahlgren Heritage Foundation in operating this museum. Working with the military commands at Dahlgren and the Navy History and Heritage Command, the Foundation will share the stories that have made Dahlgren a crown jewel of national defense. The research and innovation that have gone into weapons development for almost a century are a key part of the story. So is the impact of that research on other innovations, like the GPS tracking system we use in our cars. Beyond the technical achievements are the intellectual heritage and social history of the base. From technical directors like Russell Lyddane to mathematicians like Charles Cohen, Dahlgren has earned a reputation as an intellectual center for the Navy. At the same time, Dahlgren has created a social community, both inside and outside the gates, that has nurtured “small town” values that so many have cherished. Let us not overlook the personalities: from the naval ordnance expert who played a role in the bombing of Hiroshima to the base commander who was reputed to have raised chickens on the top floor of his residence. They’re all part of the Dahlgren story. 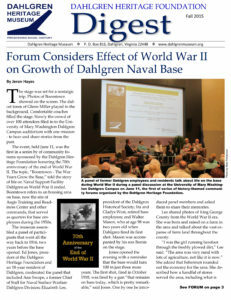 As a Dahlgren native who spent his first 18 years on the base, I am delighted to be working with the other members of the Foundation Board of Directors to make the dream of a Dahlgren Museum come true. You can help by donating to the cause and by volunteering to help. Please don’t hesitate to contact me with questions and suggestions. With your support, the Dahlgren Heritage Museum will become an archival and educational center that will help ensure that the community and the nation understand the story of Dahlgren.